The VA loan is an amazing benefit available to all eligible veterans to purchase a primary residence with no down-payment and no-monthly mortgage insurance costs. VA loans are offered by a local lender, but guaranteed by the Department of Veterans Affairs (VA). 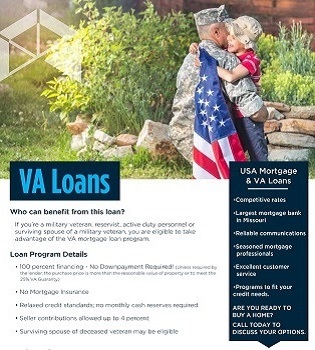 Designed to offer long-term financing to American Veterans, VA Mortgage loans are issued by federally qualified lenders, like USA Mortgage and are guaranteed by the U.S. Veterans Administration. The VA determines eligibility and issues a certificate to qualifying applicants to submit to their mortgage lender of choice. VA Home loans have upfront funding fee, but this fee can be financed into the loan, and even with $0 down payment, there is no mortgage insurance expense added to the monthly payment. The VA loan also has the option to finance qualified energy efficient upgrades to the home you are purchasing or refinancing. Clients who wish to put little or no money down. Eligible Veterans and their spouses purchasing a primary residence. Clients are looking for 100% financing within city limits. Clients with lower credit scores and higher debt-to-income ratios. If interest rates ever drop to the benefit of the client, VA loans can be easily and quickly refinanced using the VA’s Interest Rate Reduction Refinance Loan program, or IRRRL for short. This refinance loan does not require an appraisal and is usually offered with little to no lender fees. Most competitive rates offered to eligible veterans. The entire department dedicated to Veteran lending to best serve those who served us. USA Mortgage ‘s Columbia, Missouri branch has the resources needed to make your dream a reality. If you are ready to move forward with your next home purchase, contact us to get started.